We’ll soon be in the thick of apple harvest time! What’s the best way to tell if an apple is ripe? 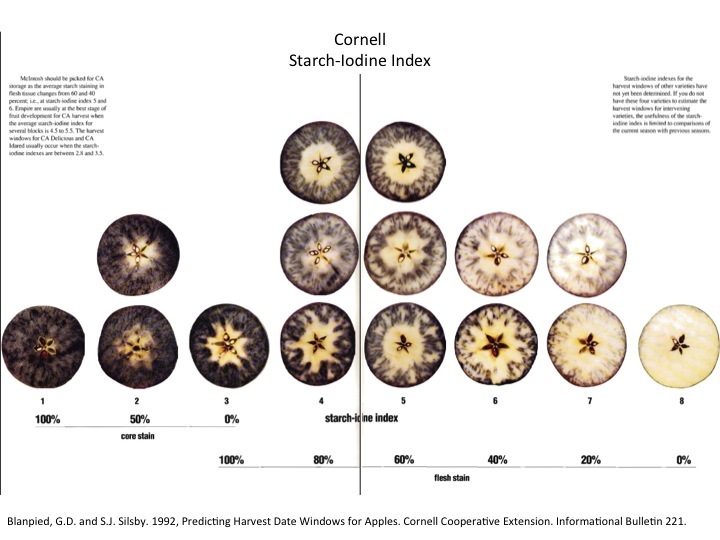 as indicated by decreasing starch staining as the apple ripens. There are several ways – 1) change in peel background color from green to yellow, 2) change in peel “overcolor” from green to yellow or red, 3) change in firmness from rock hard to being able to bite without breaking your teeth, 4) change to preferred flavor, which varies from person-to-person, or 5) change in flesh starchiness to sweetness as the starch is converted to sugar. Not all of these methods work for all varieties. Peel background color can be hard to see, overcolor can change when background color is still green, and some apple varieties stay firm or crisp (like Honeycrisp). As fruit ripen, they lose starch. Change from starchy to sweet is generally a good indicator of ripeness, and is used by many apple growers, along with the other methods mentioned above, to determine when to harvest their fruit. 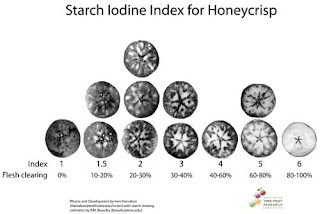 The starch iodine test is a way to measure the percentage of starch in fruit flesh, which becomes apparent after staining the fruit with a 4% potassium iodide/1% iodine solution. As the apples lose starch and become riper, they go from a dark iodine staining to a lighter staining. This article from the University of Vermont does a good job of explaining how to make the iodine solution that you will use to stain the apples. This generic chart showing change in starch pattern was developed by Blanpied and Silsby: 1992 Cornell Cooperative Extension Bulletin 221, and is often referred to as the “Cornell chart”. It was originally meant as an aid for predicting harvest windows for fruit that would be placed in long-term cold storage. The bulletin also lists the steps to sample and stain the apples. The example in the Cornell chart is for McIntosh, and ranges from a scale of 1 to 8. But not all apple varieties lose starch in the same pattern as McIntosh. McIntosh apples first lose starch from the core area around the seeds, then from the fleshy part that we eat. Honeycrisp apples do not always lose starch from the core before the flesh does. Ines Hanrahan, who works for the Washington State Tree Fruit Research Commission, developed a chart specifically for Honeycrisp apples that uses a 1-6 scale. So we can use the Cornell chart for many, but not all apple varieties.